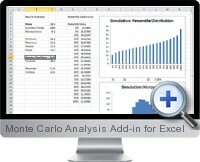 The Monte Carlo Add-In for Excel is a software package that adds comprehensive real-time probability simulations right into your spreadsheets and Excel applications. With the Add-In installed, you'll be able to construct complex simulations using a library of random distribution functions, then test confidence and return levels with a real-time iterative simulation. With The Monte Carlo Add-In, all the simulation data is accessible right in Excel - from the result of each iteration to aggregate mean and confidence ranges for test values. You can build Excel charts of your simulation results, and watch them update in real time. Simulation functions even available in VBA for scripting. Monte Carlo simulations can help reduce uncertainty in asset and portfolio management, project and resource planning, budgeting, and many other real-world business scenarios. With the Monte Carlo Add-In, you can take advantage of probability simulations directly within your existing spreadsheets and Excel applications. Includes over 20 random distribution functions. Run simulations against any data or Excel formula. Written in fast native C++ code (not VBA). Access results in Excel for charting or analysis.